The power up website features four key interactives to engage and challenge your pupils' understanding of electricity and safety. All interactives can be used on a whiteboard in full screen mode - click on the button on the bottom right of the frame. 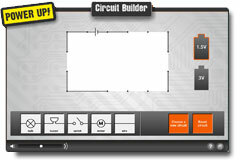 Circuit Builder provides pupils with the opportunity to explore basic series circuit behaviours at KS2 level and, more challenging opportunities involving series and parallel circuits for KS3. 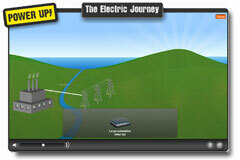 The Electric Journey challenges KS2 and KS3 users to piece together the process of getting electricity from where it is generated to the end user. Helpful tips guide pupils to successful completion of the journey. Spot the Hazard for KS2 and Spot the Hazard for KS3 challenges pupils to locate electrical safety hazards both inside and outside the home. 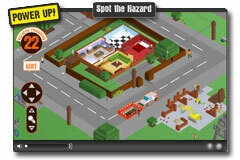 A counter incentivises the pupils to find all of the hazards. The same interactive is available to both age ranges. 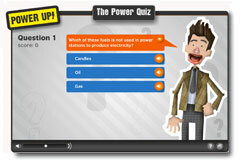 Power Up features two Power Quizzes - one quiz for KS2 pupils the other quiz for KS3 pupils. The questions have been composed to challenge pupils' understanding of the broad range of Power Up themes. Pupils will only score a point if they choose the correct answer first time. They need to answer each question correctly to be able to move on to the next question. At the end of the quiz, the pupils are given their score and invited to take the quiz again. To maintain interest, the questions are loaded randomly from a larger bank of possibilities.